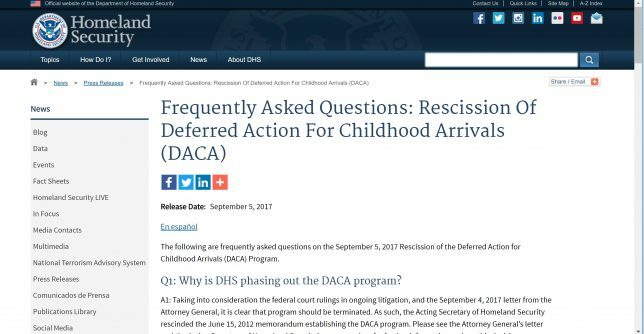 On Tuesday the Trump administration announced it was ending the Deferred Action for Childhood Arrivals (DACA) program — sort of. I am here today to announce that the program known as DACA that was effectuated under the Obama Administration is being rescinded. This policy was implemented unilaterally to great controversy and legal concern after Congress rejected legislative proposals to extend similar benefits on numerous occasions to this same group of illegal aliens. In other words, the executive branch, through DACA, deliberately sought to achieve what the legislative branch specifically refused to authorize on multiple occasions. Such an open-ended circumvention of immigration laws was an unconstitutional exercise of authority by the Executive Branch. Sessions has it exactly right. Obama exceeded his authority by unilaterally creating the program. The result was an unprecedented flood of illegal aliens across our southern border. Congress resisted Obama’s demand for an illegal-alien amnesty so he decided to use his “phone and pen” to do it himself. Ever feckless and inept, the GOP-controlled Congress did nothing to prevent this wholesale usurpation of the power of the Legislative Branch. General Sessions’ announcement appeared to finally fulfill Trump’s campaign promise to end the program, although he had originally promised to end it on his first day in office. But better late than never, right? Rep. John Conyers Jr. (D-Mich.) said, Trump was pushing a “xenophobic agenda.” Sen. Sheldon Whitehouse (D-R.I.) called it currying favor with “champions of hate and bigotry…” Rep. Luis V. Gutiérrez (D-Ill.), one of Congress’s most vocal DACA advocates, accused the White House staff of being “white supremacists.” Former President Obama called the DACA decision “cruel” and said, “a shadow has been cast over some of our best and brightest young people once again.” Such comments from left-wing activists, Democratic politicians, and media spokespeople (but I repeat myself) dominated the news. But they should actually be happy. According to Breitbart, Trump sent this tweet in response to a request from House Minority Leader Nancy Pelosi (D-Calif.) to reassure DACA illegals that they wouldn’t be deported in the coming six months. Congressional Democrats and more Republicans than would like to admit, have sought to enact a nationwide DREAM (Development, Relief, and Education for Alien Minors) Act. Such legislation has been passed in a few states, providing in-state tuition and other benefits to illegal alien youth. For obvious reasons, it is very unpopular among voters, whose American children get bumped so colleges can make room for the “DREAMers,” while we all pay higher taxes to finance that and other benefits. Trump’s position now provides cover for the many Republicans who would like to pass amnesty but justifiably fear repercussions at the ballot box. 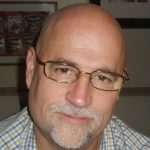 Everyone, including the media, as well as Republicans and Democrats, falsely refer to DACA beneficiaries as “kids” and “DREAMers.” But with one tweet, Trump has both legitimized the perception of DACA recipients as “kids” and enabled congressional proponents to rhapsodize openly about passing a DREAM Act. We need to create a process forward to fix the broken immigration system. Starting with the DREAM [Development, Relief, and Education for Alien Minors] Act kids… is a good down payment on what will eventually be a comprehensive solution to a broken immigration system. Everything about this is false. There is certainly no reason to believe illegal aliens are particularly stupid, but the notion that they are “the best and brightest” is absurd. And they are not “kids”. Between 2014 and 2017, an additional 272,680 have been accepted into the DACA program, for a total of 787,580. No age breakdown has been published regarding these later applicants, but almost all are 19 or older today. What the Democrats want, have always wanted, and have deliberately sabotaged efforts to control our borders for, is a flood of illegal aliens who will eventually obtain amnesty and citizenship. The Democrats know that most of these “new Americans” will vote Democrat. The number of illegals in the U.S. is estimated by Pew Research to be about 11 million, but the actual number is likely 20 to 30 million or more. In either case, it could deliver enough Democrat votes to give them electoral majorities for the foreseeable future. It would spell the end for the Republican Party. The only conclusion one can reasonably draw is that Republicans like Lindsey Graham either don’t want to lead or are actually Democrats just pretending to be Republicans. Graham gave President Trump credit for putting the ball in Congress’s court, thereby restoring Congress’s proper constitutional role in deciding immigration issues. But President Trump didn’t even do that. He is now suggesting that if Congress doesn’t act, he is happy to unconstitutionally usurp Congress’s legislative role, just as Obama did, and resurrect the program. In my opinion, Trump’s campaign position on illegal immigration, border security, and refugee resettlement, more than any other single issue, was responsible for his victory at the polls last November. That issue, and the alarming direction our country took under former President Obama, enabled the Republican Party to win control of both houses of Congress, and the largest GOP majorities in state legislatures and governorships in almost a century. If President Trump betrays these promises he will not be reelected. If the GOP Congress persists in betraying their campaign promises, their congressional majorities will be wiped out in 2018. A Democrat Congress would impeach President Trump. No matter that it would be based on entirely contrived accusations. They don’t care, any more than they care about border security, the rule of law or anything else that won’t help them personally. It will spell the beginning of the end for our country. Does the president not understand this?